Another benefit of Chamber membership – your very own online classified ads! Do you have a special offer that everyone in the community can take advantage of? A grand opening special? An upcoming sale? Advertise them here for free! 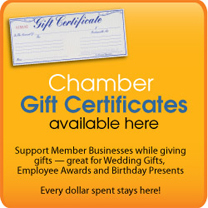 These aren’t the same as the Member-2-Member discounts – while you have to be a member to advertise here, these savings aren’t limited to the Chamber members. Call the Chamber office for more details.